my two thermometers need calibration. They both are way off in their readings. Your pit temp is different than the set temp or the readout on the display. I can assure you that the pit temp gauges are a good brand and show the air temp wherever they are located. You'll have to learn more about how they assist in the cook. I have the standard issued thermometer that comes with the loaded Wichita but they are both off as I have tested them in boiling water. Some of the thermometers have a screw that can be adjusted but I don't have that. I don't want to buy new ones because they only need to be recalibrated. 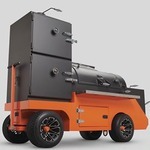 Give our Customer Service Team a call at 877.409.6337, option 2, or send an email to customerservice@yodersmokers.com.